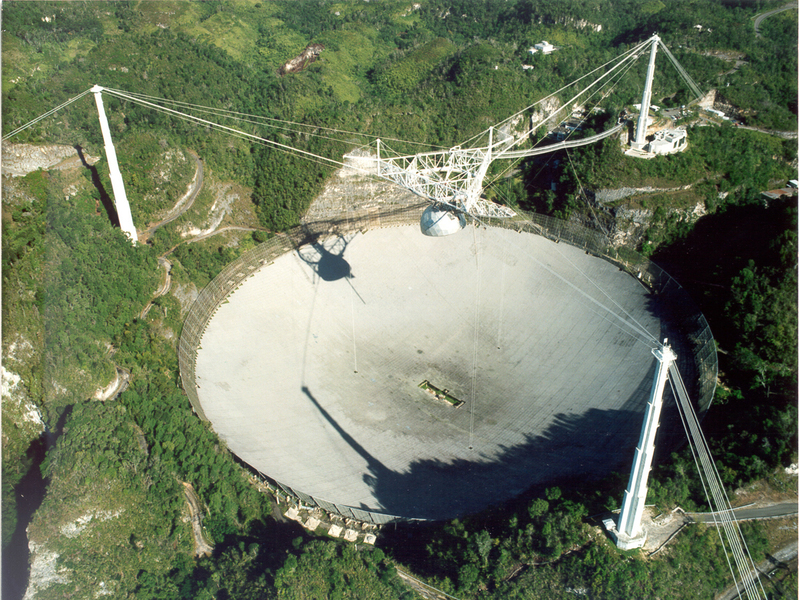 Puerto Rico's Arecibo Radio Telescope Suffers Hurricane Damage : The Two-Way Early reports that a secondary dish at the observatory was destroyed by Maria turn out not to be correct, according to a group that helps run the facility. Until it was surpassed recently by a similar instrument in China, the Arecibo radio telescope in Puerto Rico, completed in 1963, was the world's single largest. When Hurricane Maria raked Puerto Rico last week as a Category 4 storm, it cut off electricity and communications island-wide, including at the Arecibo Observatory, one of the world's largest radio telescopes. Initial reports, received via ham radio, indicated significant damage to some of the facility's scientific instruments. But Nicholas White, a senior vice president at the Universities Space Research Association, which helps run the observatory, tells NPR that the latest information is that a secondary 40-foot dish, thought destroyed, is still intact: "There was some damage to it, but not a lot," he says. "So far, the only damage that's confirmed is that one of the line feeds on the antenna for one of the radar systems was lost," White says. That part was suspended high above the telescope's main 1,000-foot dish, which lost some panels when it shook loose and fell down. The observatory, which was used as the backdrop for the James Bond film GoldenEye (1995) and the 1997 movie Contact, starring Jodie Foster, was built in 1963 and has a number of firsts to its credit: it found the first planets around other stars, was the first to image an asteroid and discovered more exotic objects, such as the first binary pulsar. And then there's the Arecibo Message, a famous signal sent from the radio telescope to M13, a global cluster some 25,000 light years away. For any sentient extraterrestrials there, it describes who we are and where the signal comes from. (Don't hold your breath though, as it'll be at least 50,000 years before we get an answer). One of Arecibo's primary areas of research is near-Earth objects, or NEOs, those asteroids and asteroid-like chunks of rock that pass uncomfortably close. Lance Benner, a scientist at the Jet Propulsion Laboratory in Pasadena, Ca., who studies NEOs, has traveled to Arecibo dozens of times and tells NPR it's probably the best place anywhere to do such research. "Arecibo just has unparalleled sensitivity as a radar facility," he says. "It is by far the most sensitive planetary radar in the world." But the aging facility's funding from the National Science Foundation has been under review for the past few years, and it's unclear how the cost of any repairs might affect that discussion. Jim Ulvestad, acting assistant director for the National Science Foundation's directorate for Mathematical and Physical Sciences at NSF, tells NPR that Arecibo is doing "excellent science." However, "if you look at the overall sweep of things that we're funding, we do have to make choices and we can't keep funding everything that's excellent."